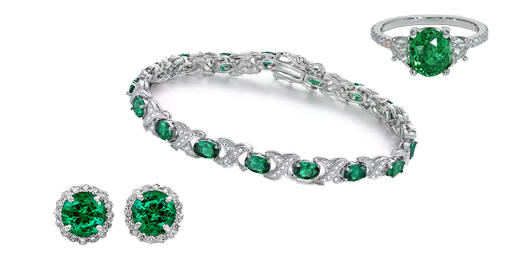 An heirloom diamond and emerald jewelry set with large emeralds and intricate design. Photo credit: Sotheby’s. Emerald was one of the first gemstones to be mined and traded. An old emerald connects its owner to a rich history that winds through exotic lands, ancient civilizations, and mighty empires. In all corners of the globe, emeralds have been used as amulets and talismans, religious symbols, astrological stones, magical stones, and healing stones. Emeralds have long been associated with courtship, love, and fidelity, and they are considered a life-affirming stone to the practitioners of New Age Metaphysics. 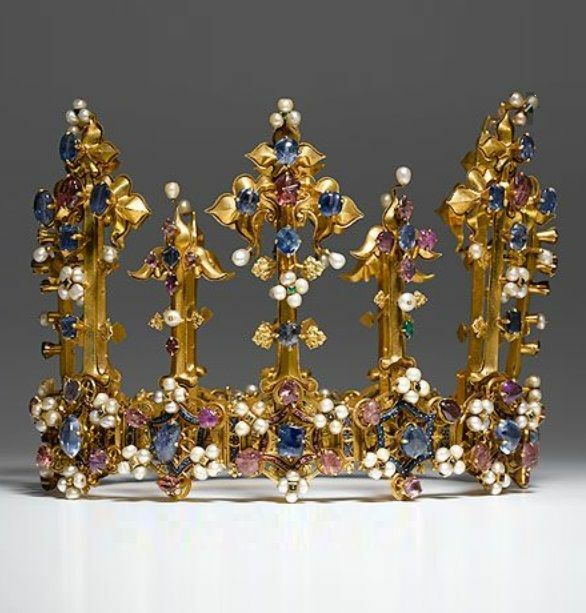 For centuries, emeralds have provided inspiration for poets, playwrights and historians. Given all this enthusiasm for the “loveliest of the green stones,” it is surprising that emerald heirlooms are relatively uncommon. This is due to emerald’s rarity and value, but it also has something to do with emerald’s relative fragility compared to gemstones such as diamond, sapphire, and ruby. 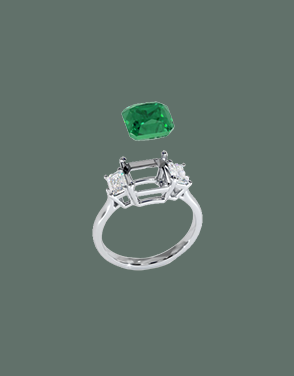 A platinum art deco ring set with a bezel-set emerald. Emeralds are very durable . 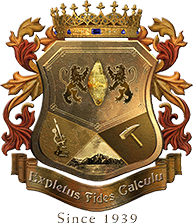 They have a hardness of 7.5 to 8 on the Mohs scale, which means they resist scratching. However, emerald is not as tough as it is hard. Emeralds can be brittle, especially if they are heavily included. If you want your emerald to be enjoyed for multiple generations, make sure you select a high clarity stone with limited fractures . Although it is not common, emeralds can also exhibit imperfect cleavage , a characteristic that has been recognized since antiquity. Some jewelers believe that emeralds are simply too rare and valuable to be worn on a daily basis or in a way that will expose them to considerable wear. They may suggest that you select a pendant if you want to create an heirloom that lasts for generations. Emerald rings may not be capable of enduring several lifetimes of daily wear—especially if they need frequent cleaning to maintain their brilliance and sparkle. A vintage emerald and diamond ring. The stone can be seen as heavily included. These issues aside, emerald makes an excellent choice for a family heirloom. The rarity and enduring value of emeralds make them a sound investment. To illustrate the point, let’s compare emeralds and diamonds. The price of diamond is maintained by controlling releases from huge reserves accumulated over decades. There are no great reserves of emerald, and it remains valuable because the Earth yields so very little of it. An heirloom emerald necklace by Van Cleef & Arpels from 1936. Compared to diamonds, emeralds are also highly individual gems. Quality in diamonds depends upon objective standards including a lack of color, a particular range of cutting angles and proportions, and freedom from inclusions –even ones that are invisible to the naked eye. Emeralds, on the other hand, are valued for their individuality and strength of color. Buyers are free to choose stones according to their own tastes and preferences. 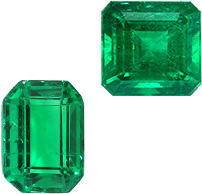 Fine emerald rough is so rare that many stones are not cut into standard shapes or proportions . Instead, the dimensions of the rough crystal, the distribution of color, and the location of inclusions determine the shape of a finished gem. Natural emeralds rarely, if ever, exhibit the total absence of visible inclusions expected in high quality diamonds. This means that every emerald comes with its own unique “birthmarks.” Some inclusions may actually increase an emerald’s value, as in the case of trapiche emeralds. A lovely heirloom emerald and diamond gold ring. 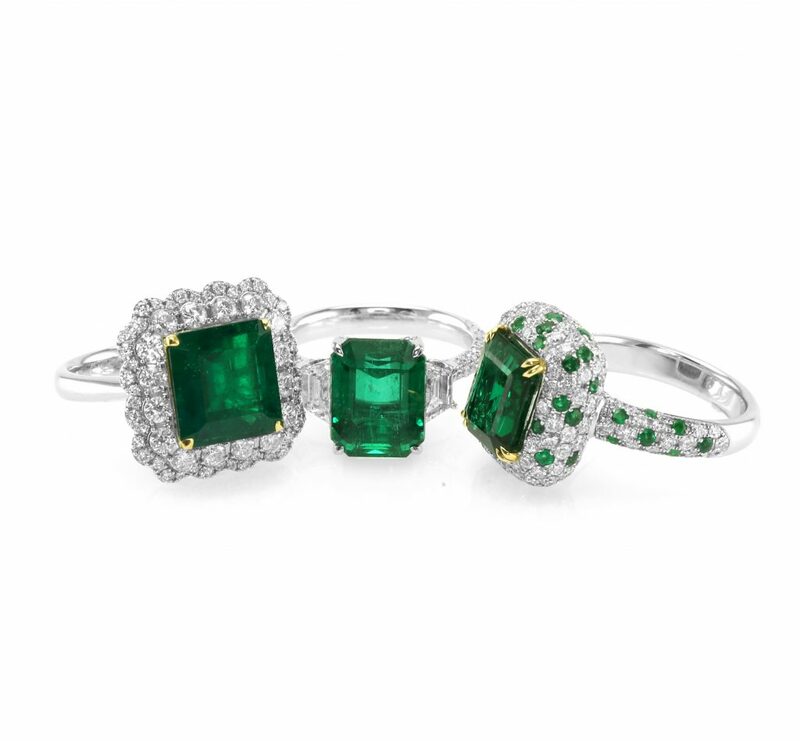 This all means that emerald shoppers can select a unique gem that reflects their individual taste and style. 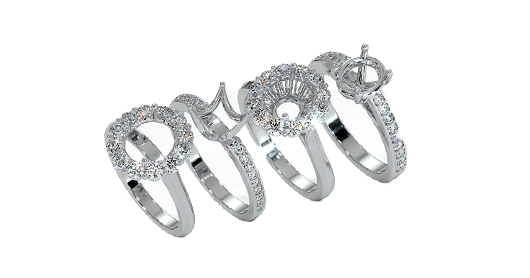 The uniqueness of each emerald also means that emerald jewelry carries strong sentimental value. 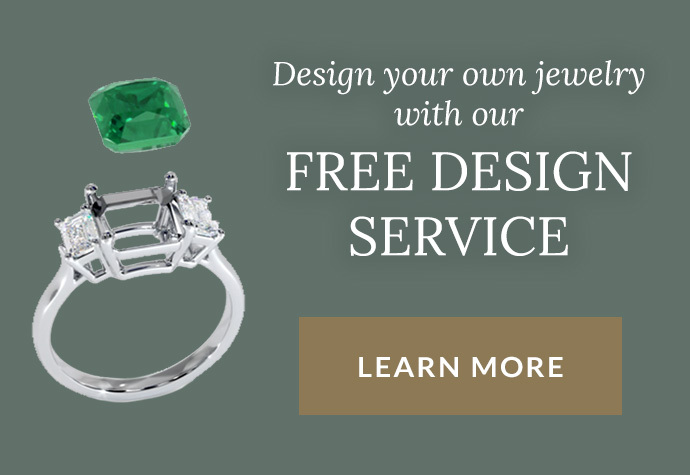 A gift as rare as emerald is a gesture of deep devotion and every piece of emerald jewelry is one-of-a-kind. 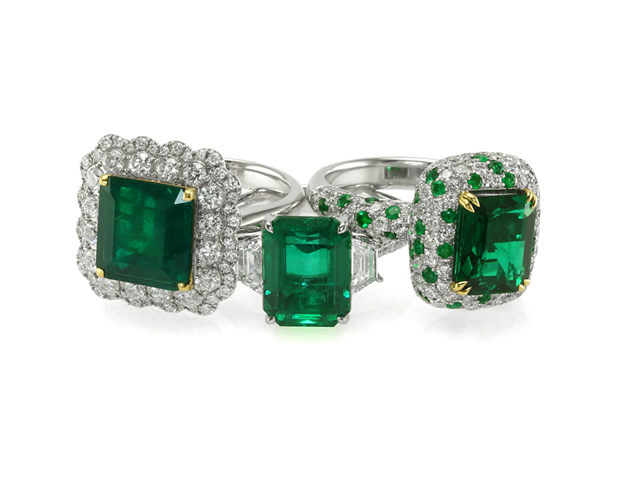 For these reasons, emerald jewelry is a good choice for a family heirloom. Your selection may initiate a family legacy of love and value that delights one generation after another. 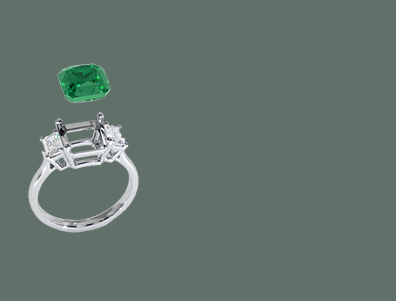 Throughout time, emeralds have appeared in many special pieces of jewelry, in varying styles. We explore that history next in Emerald Jewelry Through the Ages.